When dreaming up a perfect, sunny Saturday in Edmonton, the first thing that comes to mind is a morning stroll through City Market Downtown. I imagine sandals on my feet, a bag of market goodies on my shoulder, a Credo latte in my hand and a bouncing puppy by my side. But as the seasons change, and the coats come out, my dream of warm morning strolls is becoming just that. Lucky for me, many of Edmonton’s local food producers fail to accept that cold weather means we need give up on our favourite weekend tradition. Note: If you’re going to be travelling to visit a market, make sure to double-check that it’s running. A good resource for market listings and information is the Government of Alberta Approved Farmers Market map and the Alberta Farmers Market Association website. Now, you may be wondering “what can possibly be available at a farmers’ market in the middle of an Edmonton winter?” Fair question. Thankfully, Alberta Agriculture created the Seasonal Fresh Food Guide to help you know what to look for. Overall, you may notice a dip in the quantity and variety of available fruit and vegetables. 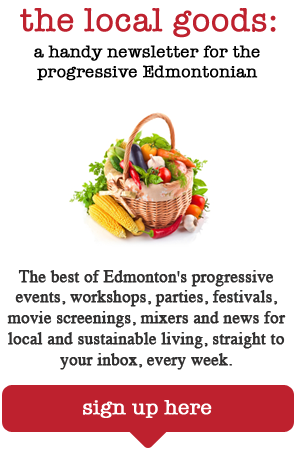 However, Edmontonians can still keep a good portion of their diet fresh and local. Food like meat, dairy, eggs and grains are available year-round. Plus, a farmers’ market is a great place to pick up unique preserves, honey, dips and baking, no matter the season. They’re also a fun place to bring family and friends who are visiting for the holidays, and an easy place to find hand-crafted, thoughtful gifts. So, let’s trade in our sandals for boots and lattes for mitten-hugged hot chocolates, embrace the winter and keep our Saturday morning market tradition alive year-round!